Although it feels like the council are constantly stalking the motorist with their army of Traffic Wardens and those murky little cars sporting the latest in surveillance cameras, we are actually in rather good shape when it comes to a fair and reasonable parking policy. In the Broadway itself there are approximately 45 FREE parking spaces that can be occupied for up to two hours. Or you can opt to use a metered car park immediately adjacent to The Broadway and accessed from Station Road and holding around 30 cars. 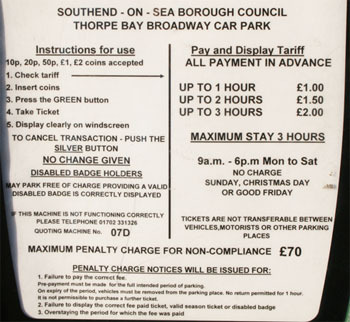 Either way, other than at the busiest times, it’s usually quick and easy to park – that means maximum convenience making visiting Thorpe Bay Broadway a great option when you need to shop. The photo shows the tariff for the pay and display.